The Raleigh Clubman road bike, part of their Road -series, provides all the endurance you will ever need. For those who are just getting into road biking, training for their very first ride or even experienced riders, this road bike has the perfect balance between efficiency and comfort. 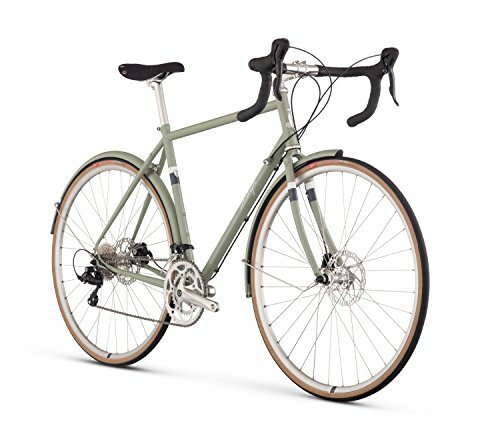 The Raleigh Bikes Clubman Bike can be best described as an all-around road bike. If you need a rock-solid frame that is more than likely to last for a lifetime, then this is the perfect model for you. Our experienced biker would like to suggest you it is an excellent choice for either gravel cycling, commuting or simply as a general purpose, highly reliable bike. It features 2×9 speed Shimano Sore STI shifters, which offer a total of 18 different gears you can choose your next ride. The bike includes aluminum front and back fenders that are designed to match with the overall city-bike design of the frame seamlessly. For unparalleled stopping power, under any number of weather- and ground conditions, the Clubman features mechanical disc brakes actuated via Tektro cables. How long will it take to assemble the bike, once it arrives? How long the assembly process takes varies quite a bit, depending on your level of experience. But generally speaking, the more experienced bikers will be up and running in no more than 30 minutes time, whereas those with no prior experience will probably need up to 120 minutes or so. Bear in mind that the company does not assume any responsibility when it corners to the assembly of the bike on your end. So, if you feel like you don’t have the necessary skills to comfortably pull it off, its certainly best to take the bike to your local bike shop and get some assistance with it. The Raleigh Clubman also comes with all the required tools included in a separate box, so you have everything you need to assemble it right there. It comes approximately 90 percent pre-assembled in its package. The Raleigh Clubman road bike as having an updated classical road bike for your comfort bike riding. The color is somewhere between grey and green (although the latter seems more accurate), when in well-lit conditions. The handlebars are shaped in a classic fashion and come wrapped in a black gel bar tape, finished with a beautiful chrome bar end. Overall it can be described as a classy and elegant looking classic bike, with an updated look and feel to it. Our expert guider refers to it as an extremely cool daily-use bike for all-around cycling. So you can take it for your daily riding. The most important ones are the fact that it comes in eight different sizes, to meet the needs of any potential rider. The disc brakes are very reliable and provide a sturdy and powerful stopping power. The relatively quick speeds that can be reached with the bike (34/50). It constitutes a highly inexpensive option for riders who are just looking to get into road cycling or even more experienced bikers who want more options to choose from the best one. The bicycle kit is very rugged. Every biker also hails the Raleigh Clubman as providing a remarkably smooth riding experience. It is quite eye-catching from an esthetic point of view, even for a daily-use bike. The lack of available color options. The fact that the assembly process does require some minor adjustments to mount the components together safely properly. The Raleigh Clubman road bike comes highly recommended as a sturdy, reliable all-around bike for all enthusiasts. Its good geometry, smooth handling, riding comfort, and speed are among its top features and will be sure to make any cheap road bike lover more than happy to own one.